Hawkins Chapel is a small church serving the small town of Frederick, Oklahoma. About an hour’s drive southwest of Lawton, Oklahoma, Frederick is a vibrant community with an exciting history. We installed church pews in Frederick’s Hawkins Chapel a few weeks ago and were delighted to find out more about the town. President Theodore Roosevelt visited the town on a wolf hunt in April of 1905 and the Abernathy boys started their Sante Fe Ride from the town. For a small community, Frederick has a storied past. The town was originally two separate communities that were established side by side but when a new train line was built, the conductor of the first train promised the townspeople a flag and flagpole if they would name the town in honor of his son, Frederick. The townspeople agreed in 1902 to name the town after him but didn’t see a flagpole until 1962, sixty years after they fulfilled their end of the bargain. The namesake of the town was a 16 year old who never even came to the town. Most of the people in the town that bore his name didn’t know about Frederick, either, until 1976 when the town’s Heritage Committee finally learned — and wrote — about Frederick Van Blarcom. At one time Frederick was a large town and an epicenter of life in that area of Oklahoma but when the railroad line was changed in 1973 and moved away from Frederick, the community started to decline like many other towns that were once on railroad lines. By comparison, Frederick is smaller than other communities in the area, like Lawton, Wichita Falls, and Altus, but is still an important community for many families in southwest Oklahoma. 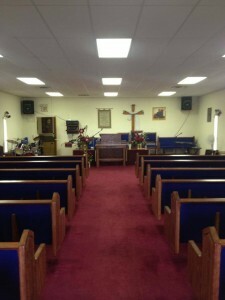 Hawkins Chapel is a small church and we installed fewer than ten church pew. We know that most churches of this size might think they’re not big enough for a church pew company to service. 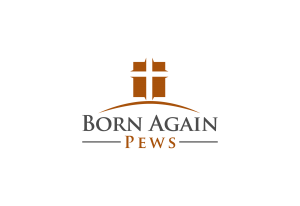 Born Again Pews, however, welcomes churches of smaller size that need church pews. We’re based in a small community in Twin Oaks, Oklahoma, and understand what it means to live in a small town. Small churches are just as important as big ones and merit beautiful church pews, especially since churches are all equal in the eyes of the Lord. If your church is hesitant to buy church pews because you think your church is too small, call us and find out how we can help.